Protecting victims of medical malpractice in Washington, D.C. Medication is supposed to make patients feel better, not worse. Across the country, however, it is estimated that around 7,000 people die each year because of mistakes made with medication. This makes medication errors one of the leading causes of preventable death or injury in the country. 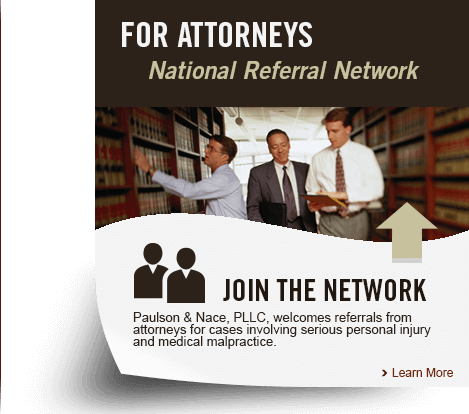 Paulson & Nace, PLLC, knows what it takes to build a winning case strategy for malpractice victims. For more than 40 years, our skilled team of trial attorneys has helped people throughout Washington, D.C. obtain millions of dollars in compensation after they were injured or harmed by a negligent doctor or hospital. As a family law firm, we know that the future of your family is the most important thing in your life; let us help you protect them. Sometimes, the medication error is directly related to the software used to prescribe it. New technologies allow doctors to submit a prescription with specialized apps, or through a system designed specifically for healthcare providers. Our team takes on complex liability cases where the software or hardware used to store patients’ records, submit prescriptions or share medical histories has failed to work properly, leading to adverse effects on a patient’s health. When there are multiple variables at play in your case, you want a legal team who can uncover the truth and who is willing to go the distance with you. Paulson & Nace wants to be that team. We see our cases through to the end, and we refuse to settle a case for less than it is worth simply to avoid a trial. In truth, our attorneys thrive in a trial setting, utilizing cutting-edge technologies and clear, everyday language to help judges and juries understand exactly what went wrong. We occasionally call on authoritative outside sources to help us build your case, providing you – and the jury – with a more comprehensive view of the event. Our in-depth understanding of medical malpractice laws, combined with our ease in speaking to judges and juries, has helped earn us a reputation as premier patient advocates in Washington, D.C. Even a seemingly minor medication error can have catastrophic results. Paulson & Nace, PLLC, understands what that can mean to you and your family. Please call 202-930-0292 or fill out our contact form to schedule a no-obligation consultation with one of our lawyers. We are proud to help families throughout Washington, D.C.